"Basil is the predictable partner for tomato, but mint comes from the same herb family and in my mind goes just as well," asserts chef Anna Jones, who decided to turn away from meat in order to lighten her footprint on the planet. "I like to make the most of the variety of different coloured and shaped tomatoes we have access to in the UK. I can’t think of a more beautiful plate." Preheat the oven to 220°C. Place the feta on a baking tray lined with baking paper. Grate over the zest of half the lemon, sprinkle over the bashed coriander seeds, season with some black pepper and drizzle with a touch of oil. Roast in the oven for 25 minutes until the feta is starting to turn nicely golden. While the feta is roasting, chop the tomatoes into different-sized chunks and slices, and place them in a bowl. Season well with salt and pepper, grate over the rest of the lemon and drizzle with a couple of tablespoons of olive oil. Add half the lemon juice, then taste and add more if needed. Mix well with your hands and leave to meld. 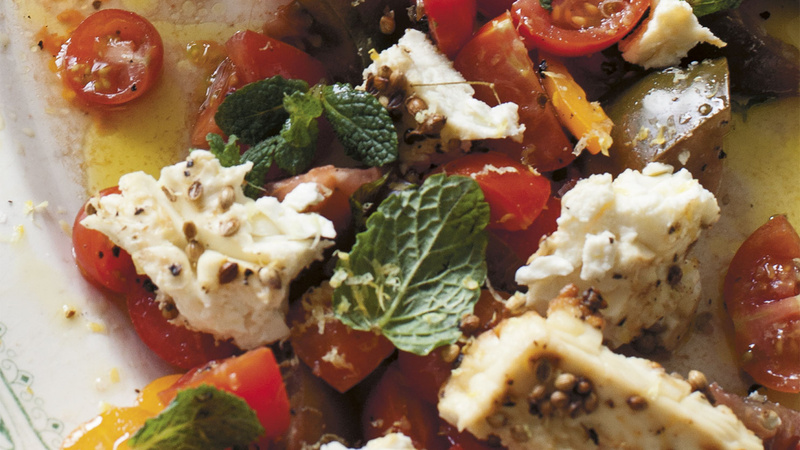 Once the feta has roasted, lay the tomatoes on a serving platter and scatter over the mint. Use a spoon to dot chunks of the feta over the tomatoes and serve immediately with plenty of warmed pittas or olive oil-drizzled toast and some green leaves.